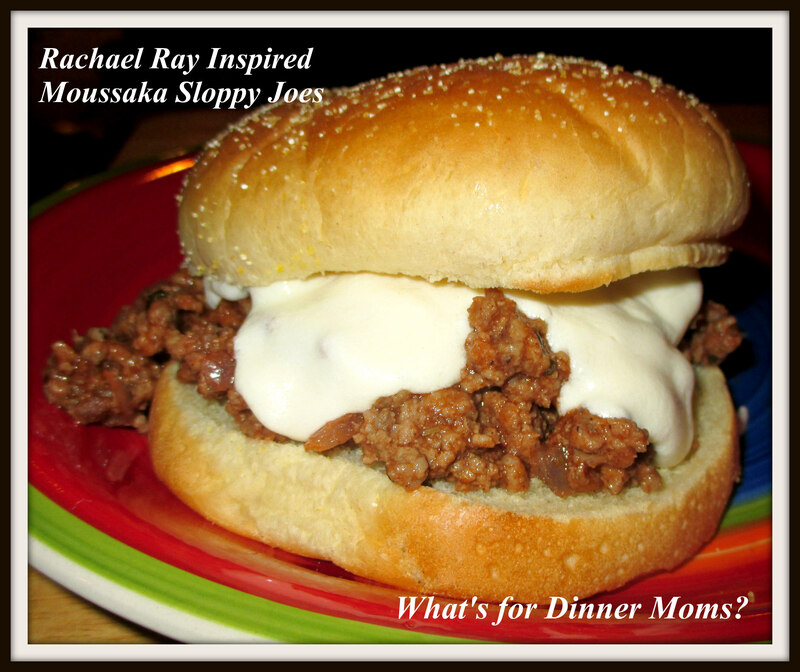 Rachael Ray Inspired Moussaka Sloppy Joes – What's for Dinner Moms? As I was driving around town today I noticed all the signs for $5 lunches. I thought, “Hmmm, that’s not bad.” But, then the other side of me kicked in. That is lunch for one person. Could someone take that money and make dinner for their family with it? Of course. I started to think of all the ways I would use $5 at the grocery store. With some garlic and basil I have a pizza dinner for the family. Add some garlic, basil, onion powder and oregano to the sauce, wilt the spinach and saute the mushrooms before stirring them into the sauce. Make the spaghetti and serve with spaghetti sauce. Italian dinner for the family. I think I see some posts in my future about $5 or so meals. This meal was not $5. It wasn’t overly expensive but ground beef alone is up to $3.69 for the cheap stuff now. We love the flavors of Moussaka. I do enjoy Rachael Ray recipes but have found for my family I usually need to double or triple the spices. We are a bold flavor family. So, this recipe is hers using the spices for my family. This was a hit. I wasn’t sure because everyone said it was “good” but then my kids went back for seconds. Okay, it was better than good. That is usually my measure. If they go back for seconds it is really good. If they eat it with no complaints or compliments it is just good. I served this with a green side salad and homemade hummus and veggies. In a large skillet over medium heat cook ground beef breaking it up into small pieces. Cook until browned through. Add salt, pepper and cinnamon to meat. Add onion, marjoram and red pepper to pan. Cook until onions are softened 3-4 minutes. Add tomato paste to meat mixture and cook until it turns a deeper red 3-4 minutes. Stirring constantly. Lower heat to low and add chicken stock. Simmer, stirring occasionally, until mixture thickens in about 10-15 minutes. In a small saucepan melt the butter over medium heat. Stir in flour once butter has melted. It will form a thick paste. Stir over medium heat for 2-3 minutes. Whisk in half and half. Cook until mixture thickens into a nice cheese sauce consistency. Season sauce with salt, pepper and nutmeg. Remove sauce from heat and stir in Parmesan cheese. To serve sloppy joes place meat mixture on the bottom of a roll. Cover with cheese sauce and then place bun top over cheese sauce. Serve while hot. I can understand why this was a hit! My family likes the extra spice as well! Looks good and yes much cheaper at home and yummier!